We’d love your help. Let us know what’s wrong with this preview of The Moonspinners/Nine Coaches Waiting/The Ivy Tree/Madam, Will You Talk? by Mary Stewart. 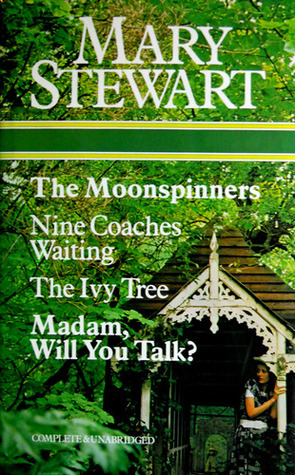 The Moonspinners/Nine Coaches Waiting/The Ivy Tree/Madam, Will You Talk? To ask other readers questions about The Moonspinners/Nine Coaches Waiting/The Ivy Tree/Madam, Will You Talk?, please sign up. I read Mary Stewart's The Moonspinners for the Greece stop on my Around the World challenge. I was interested in the story, which is set specifically on Crete, immediately. However, it did not capture my attention quite as much as her other books; I kept waiting for something to happen which would hook me until the end of the novel, but such a thing never quite came. This is the first of Stewart's books which I have read that feels overly dramatic; normally, she balances the drama and suspense rather well, but it was markedly overblown at times here. The relationships within the novel feel too sudden, and are not developed as I would expect. I also found the plot a little predictable; there were none of the surprises here which I have come to expect from Stewart's fiction. Whilst The Moonspinners is entertaining enough, I would have to say that it is probably my least favourite of the author's novels. I read this for my Around the World in 80 Books challenge, choosing it for one of my favourite countries, France. I really enjoy Mary Stewart's fiction; all of her books are markedly different, despite sharing similarities in terms of traits and characterisation. As ever, Stewart's real strengths here come with setting the scene, and building her protagonists. Nine Coaches Waiting, which takes place just a few miles away from the Swiss border, has a wonderfully Gothic feel to it. I found it highly immersive, so much so that the many notes which I had planned to take in order to write a long review fell by the wayside. I could hardly pull myself away from this well-plotted novel, and it is definitely my favourite of Stewart's books to date. I find Mary Stewart's books rather quick to read, as well as comforting pieces of escapism, which balance wonderfully with heavier thesis-applicable tomes. The Ivy Tree was the next of these on my to-read shelves, and I was pulled in immediately. The plot here is markedly interesting, and manifests itself well; it is perhaps my favourite from what I have read of her work to date. Partly, this is because the story - whilst largely unlikely - deviated in some ways from what I have come to expect of her an author, and added a couple of surprises into the mix. The pace here is marvellous, and The Ivy Tree is definitely a page-turner. Throw in some Insta-love and stir well! We also get a potential wicked step-mother,(view spoiler)[ (and I could tell from the very first pages something was off about her. Then when it was revealed she'd lied about Richard dying to David I realized what a monster she was.) (hide spoiler)] and lots of assorted baddies who keep you guessing as to who they really are and where they fit into this mystery. I think all the car chases and having Charity be such a superb driver was quite a twist for the time period--1955--the book was written. My only complaint and squick factor was (view spoiler)[ when Richard actually hurt Charity badly enough to leave bruises on her wrist that she later had to cover up with a bracelet. She still had them at the end of the book when he proposed to her and I don't think it's addressed again except for a comment where it mentions Richard's "rueful grin" which is not a proper apology. Whether he thought she was involved or not, he shouldn't have hurt her. (hide spoiler)] I took off 1/2 a point for this. Not my favorite so far of all I've read but interesting to see earlier examples of insta-love after having read so many current YA full of this trope. i only read the moonspinners. too busy to read all 4 books right now. good but wayy different than the movie! Yup. I'm going to read them all (again) start to finish. Ahhh... summer! I reread her books frequently. Good clean, intelligent fun.